In Maine, there aren't enough cooks in the kitchen. 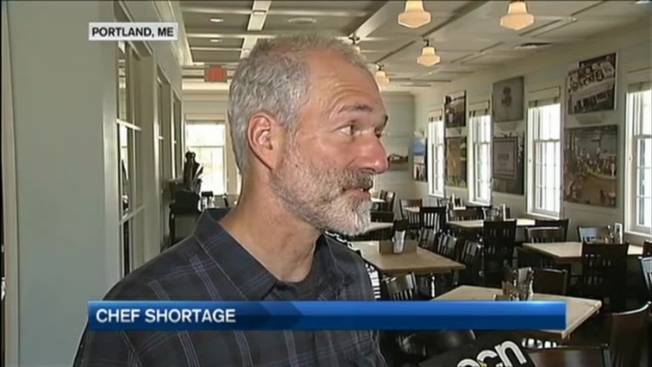 Restaurants from Kittery to Portland to Bar Harbor are reporting chef shortages heading into the busy summer season. "Everyone is in the same boat," said Steve DiMillo, owner of DiMillo's floating restaurant in Portland. He is looking to fill three line cook positions for broiling and sauteing - and said many applicants simply do not fit the bill. "Those are a bit more skilled positions," he said. "You've got to have a touch for that." At Robert's Maine Grill in Kittery, owner Michael Landgarten is looking to hire five or six line cooks. "We're short - we're just not seeing applicants," said Landgarten, who also owns Bob's Clam Hut and Lil's Cafe in Kittery. He said there are a number of factors that have caused this chef shortage statewide. First, there's increasing competition from other restaurants. The food scenes in Portland; Portsmouth, New Hampshire; and neighboring communities are exploding. As more restaurants open, there is a greater demand for line cooks. "There isn't necessarily a corresponding number of folks who want to cook for living," said Landgarten. Many restaurants depend on seasonal workers from other countries to fill positions in the summer, but Landgarten said there's a delay this year getting visas. "Because of Justice Department complexities, I think because of security reasons, we are delayed," he said. He is offering a $1,000 referral incentive to his employees, and even sending his Human Resources Director overseas to Romania to recruit workers. Even James Beard Award nominated restaurants in Portland are having a tough time filling positions. The owners of Hugo's, Eventide, and the Honey Paw are looking to immediately hire kitchen help as they head into Memorial Day weekend.